Now, I get up early and dress in the shadowy front room, preparing for a day of teaching: the pants, the shoes, the shirt. A tie draped around my neck, then four quick motions. Done subconsciously, my mind already on the day ahead. Now, I am just a man in the dark. Then, it was my father up early, dressing in his bedroom. I was a four-year-old girl, a sometimes witness to his morning routine. The ritual. Selection of an album: Dylan or The Beatles or The Byrds. I liked the Dead’s Anthem of the Sun because the cover was purple and psychedelic, but my father said it was not morning music. He would unclasp – snq snq – the plastic cover of his KLH turntable and set it on the floor, like a turned-over turtle. Using both hands, fingertips daintily on the edges, he’d settle the record. The drop of the needle set static rustling through the speakers, little sparks in my ears. Already, I had climbed into the turntable’s cover. And now the floor was an ocean, the cover my boat, the rag rug (woven by my mother) a distant island on which I might consider marooning myself. Finally, the tie. The quick, careful turns of the knotting, the tugging, the aligning. Even on mornings when (for reasons unfathomable to me) he had to reknot it again and again, I could never discern how he accomplished this feat of prestidigitation. All I could say was: it was not like tying your shoes. At last, he’d lift the needle, sheath the album. My boat became no longer a boat. I was, then, a four-year-old girl, looking up from an imagined ocean at a great mystery, longing for something I couldn’t explain, something I had no words for, something I could not do, something I could merely, inexpressibly, want. Then, dressing up was a peculiar horror. There were tights, white, with a sort of cable pattern on them. And dresses, or skirts with slips. There were shoes, navy blue flats, at whose tops I’d stare for hours on end at whatever party we were attending, hating them. There were barrettes or headbands. Little necklaces with pendants or pearls. There were fights, lots of fights. For my brother, there were chinos and a white button down shirt. A navy blue blazer with brass buttons. And. A red and blue diagonally striped tie. Never a clip-on. I can recall waiting in the kitchen, my dress tantrum over and lost, a sulk rising in me, coming up purple-black like a bruise. My brother fidgeting as my father knelt beside him, my father’s hands overlarge on that little tie. Flip, flip, flip – Not so tight, I’m choking, my brother would complain. My father would tug the knot straight – arughgug, do I have to wear this thing? It’s killing me. My tights itched already: a four, six, eight, ten-year-old girl, dying to get out of these clothes. At night, I’d pray for God to make me a man, though I suspected that this was not something God would do. Something like that would have to be magic. I lifted a black and blue tie, its stripes arranged to look like shards, as if the tie were exploding. It was something my father would never wear. “Just this,” I said, so happy for the sir that I was delighted to overlook the condescension. And the price tag. He laid the tie in a tissue-paper-lined box. I saw him slip in a card before he closed the lid, sealing it with a gold sticker. In my room that evening (I was away from home at a summer program, learning biochemistry and calculus and what it meant to be transgender), I lifted the tie out and placed it around my neck. The card, on heavy cream-colored stock, was not a business card. It bore the title: “The Four in Hand. 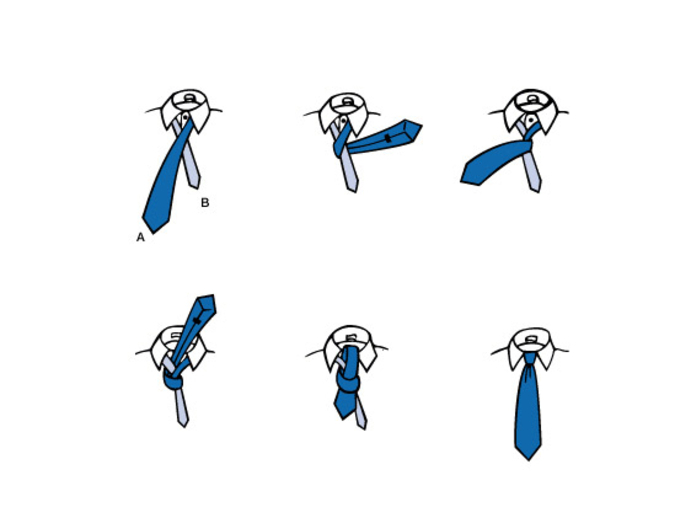 The Schoolboy’s Knot.” Below, a series of diagrams in which disembodied hands worked at a tie. I stood over the instructions. Around, around, through. Tighten. Look in the mirror. It was pretty good. But it was not like my father’s. It was a bit slouchy, a bit too large; it just wasn’t the right shape, even though I couldn’t say what that shape was. I ignored the card and stared into the mirror. Flip flip flip. How did my father do it? Around and around? I tried to remember it. I remembered the records. I remembered my boat. I remembered the itchy tights. I couldn’t remember the knot. I couldn’t remember something I never knew, a magic trick I never learned. I tried again, up and over and around. Not quite. I went back to the salesman’s card, to the four-in-hand. Around, around, through. Simple. But not right. I could have asked my father. After all, I went home at the end of the summer and came out to him and my mother in a scene that had every cliché component one might expect: the kitchen table, the tears, the pronouncement that I was ill, or wrong, or confused, or all of the above. Still, I could have asked him, and he probably would have shown me; he might even have offered me a few of the ties he seldom wore. But I didn’t ask. I was seventeen, and I wanted to show him – and everyone else (most of all, myself) – that I could be a man on my own terms. That fall, I returned to prep school as a senior; it was my fourth year at the school, my first year as a guy. Dress code required a coat (mine was navy blue with brass buttons) and tie for boys, which they hated and I loved. The other students accepted my presence, giving space for my new-found gender. Some grudgingly. Some with admiration. Most with the feigned nonchalance for which adolescents are infamous. It was October when I saw it. I was waiting in the hallway of the Academy Building – marble floor and dark wood wainscoting – for my math class. The place smelled of chalk, of tradition. One of my classmates approached and we stood in the awkward manner of those standing and waiting anywhere. That’s when I saw it. “How’d you tie that knot?” I asked. His tie was square across the top – a perfect straight line. The sides tapered evenly below, forming an almost-triangle. It was my father’s knot. The knot that I rowed toward on my imaginary ocean. I did. Again and again, until the bell rang. And then, after classes and sports, I stood in front of my mirror, going over those motions once more, feeling his hands on mine. Over, Under, Around, Through. There had been years when I stood in front of a mirror, curly hair bunched back in a sulky ponytail, wondering why no one else saw I what I felt – what I, even, saw – that I was a man. That I was not the girl everyone insisted I was. Now, 17, and not a girl anymore, not entirely, I saw for the first time what I wanted to see in the mirror. Something I’d been searching for, searching though it was nameless, inexpressible. But I had it now. Over, Under, Around, and Through. It took time, as it always does, for everything to settle between me and my parents. Years of slips with pronouns and my name. The assumptions that this might be a stage, something I’d grow out of. The implications that I was heading for disaster and a dim future. All this passed. I grew up; I became the man I had prayed to be. My father retired; my parents moved. I helped them pack the endless boxes of dishes and books. We laughed over the photo albums, the holiday pictures of me and my brother, sullen in our finery. I brought up my father’s old KLH turntable, which had been gathering dust in the basement. “You want it?” he asked. I took it home, along with a box of records. The plastic cover had faded from blue to gray. I opened it – snq snq – and set it on the floor, a turned-over turtle. The speakers had yellowed with age, but Dylan sounded the same as ever. The cover on the floor, though: how had I ever fit in that? It is dark when I dress in the mornings, except for the first and last months of the school year. That’s fine. I find the chinos, the white or blue button down shirt. I slide a tie off the rack. In the darkness, my mind still clogged with dreams, my hands go through the motions. I tie my shoes on last. My hair is short enough that there is no need to brush it. If I grew it longer, no amount of brushing would ever fool it into lying flat. I head out to teach at this prep school – not the same one I went to, but of a similar ilk. The boys all wear ties. On chapel days they wear blazers. Many of them navy blue with brass buttons. I am Mr. Myers the English teacher. I am out as transgender, but it doesn’t come up often and, when it does, sometimes the students tell me that they had almost forgotten. I’m just Mr. Myers. One evening I am on dorm duty, not long past the start of a school year. It is after study hall and all of us are relaxed in jeans and sweatshirts, watching baseball in the common room. The boys are discussing dress code, complaining about having to wear ties (especially because the girls have no dress code). “I can never get the knot to look good,” says a sophomore. “Well, what kind do you tie?” a senior responds. “There’s different knots?” the sophomore says. The sophomores in the common room run to get ties and then there are six of us lined up in front of the bathroom mirror. “You want to show them?” I ask the senior, knowing that there is no pleasure like teaching. “No, you do it,” he replies. Not quite perfect – they never are. I needlessly fidget with my own tie, getting the knot snug and square. Somewhere, way beyond the mirror’s surface, I can still see my father’s morning ritual. I can still feel the hot plastic of my imagined boat. I look up from my voyage to see the wrapping, the turning, the knot emerge, like magic. Alex Myers was born and raised in Western Maine. He earned his MFA from Vermont College of Fine Arts. His nonfiction has appeared in The Rumpus and Conte, among other places. In January, his debut novel, Revolutionary, will be published by Simon & Schuster: it tells the story of Alex's ancestor, Deborah Sampson, who -- in 1782 -- ran away from home, disguised herself as a man, and fought for a year and half in the Revolutionary War. Alex currently lives in DC with his wife and two cats.